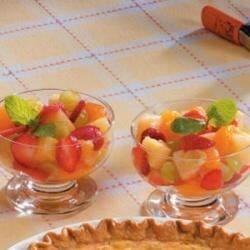 "Pineapple chunks, mandarin oranges, strawberries and grapes are treated to a dressing of wine and sparkling club soda in this delightful salad. Serve in dessert dishes or set the whole bowl on the table for a fetching presentation." In a large serving bowl, combine the pineapple, oranges, strawberries and grapes. Combine wine or grape juice and club soda; pour over fruit. Cover and refrigerate for at least 2 hours, stirring occasionally. Serve with a slotted spoon. Good, but somewhat unremarkable in my house. Absolutely nothing wrong with it; a fine standard recipe to keep on hand for just about any occasion. I took this to a church group and everyone loved it. The "juice" turned red from the strawberries, but it tasted great and refreshing! This was awesome. I made it for a babyshower so I used grape juice and club soda but it was still excellent. Easy to make. Looks pretty in the bowl and Super refreshing. SUCH a delicious, refreshing recipe! I made it for a BBQ, and it was an immediate hit! I highly recommend this recipe! It is SO easy to make! Really good, but not incredible. I will probably make this again, just so I have a different way to eat fruit other than plain. I used this recipe for my daughter's graduation, it was a big hit. It is something you can make ahead of time, very refreshing. I also used canned pineapple and fresh banana's (which did not turn brown.) Instead of the club soda/juice I used gingerale. It was good, but nothing to rave about.